Simple Church presents and defends the premise that churches should establish a simple process for maturing believers and model every aspect of their ministries after that process. A solid book that gives good insight and practical ideas for streamlining a church to have the greatest effect on lives for Christ. Research-based books are always dangerous in that they can take bits and pieces from a variety of churches and make it seem normative for any church. The model in Simple Church is an ideal, but ministers are wise to set their priorities and make changes slowly to avoid alienating their congregation. Thom Rainer and Eric Geiger are passionate about the results of their recent research. After extensive survey work examining vibrant and stagnant churches, they are convinced that the defining characteristic of a vibrant church is its simplicity of process. Simple Church presents and defends the premise that churches should establish a simple process for maturing believers and model every aspect of their ministries after that process. Rainer and Geiger elaborate their case in the same manner they instruct the churches to present their process, simply and repetitively. Specifically, they define the four core values of a simple church’s process as clarity, movement, alignment, and focus. Acting on the assumption that churches are already aware of the Great Commission’s focus on making disciples, Simple Church instructs the leader of a church, in evaluating its ministry to the world, to first and foremost clearly define its process for making disciples. To do this, the pastor has to identify a few key elements of a mature disciple, extrapolate what processes are necessary in the maturity of this disciple, and determine appropriate programs that specifically line up to accomplish this process. Churches must be highly selective about choosing these key traits and processes to maintain simplicity and clarity. To even better clarify this process of transformation, Rainer and Geiger recommend several steps. The first is to simply but completely illustrate the process, showing the path of a disciple’s transformation and increasing understanding of the process. The next steps are for the leaders to measure the member’s progress through the stages and to discuss the process thoroughly with the church leadership in a variety of ways. The importance of clearly defining the goal and process for members of the church cannot be overstated. A clear process of discipleship gives direction and purpose to ministry. It helps define which ministries are helpful, and how best to pursue them. It also helps members to evaluate their own activity in the church and to make wise decisions about their own spiritual progression. Finally, it gives the leadership of the church an effective means of evaluating their ministries, goals, and the health and growth of the church. Rather than simply observing the business of the church, leaders can now monitor the spiritual growth of the members on both a church-wide and individual level. Part of any process is movement from one stage to the next. When the process is undefined, as it is in many churches, movement is congested and members’ spiritual growth stagnates (136). The next step after clearly defining your process is strategically building programs that move disciples along the process. At each stage of the process, the leaders design a program that specifically targets that stage. The programs are designed sequentially, so there is a clear entry point for new members and each program clearly leads disciples to the next stage of the process. In addition, the church designs stepping stones to assist members in making the jump to the next phase, such as keying in on relationships, creating short-term steps, and providing guidance for new believers (150-151,158). Once again, clarity plays a key role, as leaders and members discover “what’s next” in their spiritual growth in the church (152). Christians want to know that there is a purpose and a goal in their life. The Bible clearly defines the goal of Christian maturity and Christ-likeness for Christians, but the church has typically poorly defined the process for its members to approach that goal. A designed movement through the maturity process encourages believers by simply establishing what it looks like to serve Christ and grow in Him in this church. It eases them through stagnation and confusion, and builds the church by developing disciples that minister, share their faith, and disciple others. Most of all, it encourages the church as a whole as they constantly see the growth and potential in each member’s life. While movement might be the hardest point of the process to design, alignment is one of the hardest states to attain and maintain. There are some vital preparatory steps to take before approaching a ministry model change as drastic as the Simple Church model. The first step is to recruit staff and leaders that can understand, support, communicate, and enthusiastically implement the process the church is adopting (170). After enlisting the right leaders, it is important to develop a method for accountability – a framework for communicating about standards and goals within the process (175). While doing those two things will establish clear objectives with the staff, there are some additional keys that can bring the church as a whole together in this process. One such key is to “implement the same process everywhere,” making sure that each ministry within the church uses the common vocabulary, process, and movement (178). This speeds up absorption of the process and helps to avoid contradictions and confusion. It is also important to keep communicating the process to members, keying in on important milestones and specific instances of success. A church that is not unified in the need for model as aggressively simple as this one will not be able to successfully make the transition to it. It is vital that leaders take steps to build consensus on the process among themselves and then among the membership before adopting the process. If not, it will result in grumbling, factions, and eventually open disputes in the church as ministry methods are questioned and attacked. This stage of preparation can take a long time, but a divided church at the onset of this process will only grow more divided as programs are dropped, traditions are slighted, and leaders are pitted against each other. Focus and alignment are intertwined in Simple Church. Focus is the important concept of prioritizing ministry to align with the process. Churches that offer many activities are attractive, like restaurants with a broad menu (199-200). To be effective, however, the church should focus its time, efforts, resources, and finances into one thing: accomplishing the purposes set forth for it by God (201-202). Unfortunately, in reprioritizing favorite programs, traditions, and events, this focus becomes a point of instigation – disrupting alignment and causing rifts. Simple Church reminds us that we are called to be wise stewards of both our time and money (207-208). Focus allows us to prioritize members’ limited time into the process that will benefit them the most in their spiritual walk. Any ministry program, expansion, or addition should be examined to make sure it conforms into a primary stage in the process. If it cannot be conformed to the process, it should be dropped (200). Rainer and Geiger explain: focus and greatness are inextricably aligned (225). By not watering down or congesting our programs, the church finds freedom to excel in its purpose – maturing disciples. While it is a difficult choice to balance a need for simplicity with a desire to continue a good program, focus allows us to do well what God means for the church to do. As a church excels in maturing its members, then those members will be better equipped to minister and serve. Focus allows us to build more complete ministries, led and equipped with mature Christians who are better able to judge and apply what is honoring to God. A key for this kind of focus will be to build a passion for the process of making mature disciples. Church members will not give up traditions, events, and favorite programs for anything less than the mission of God ingrained in their hearts. Simple Church is a challenge to rethink all the good things we do in church. As with Rick Warren’s Purpose-Driven Church, Thom Rainer and Eric Geiger present a strategy of determining the purposes of the church and building programs to serve those purposes. Rainer and Geiger go a few steps further, however, in arguing for the need for a simpler, clearer presentation of the process of discipleship, and a closer one-to-one alignment of programs along that process. It is a well-reasoned and supported approach, but one that will be difficult to implement in most churches. Even so, I will be applying many of the principles of Simple Church in my ministries, both small and large. Rainer, Thom S. and Eric Geiger. 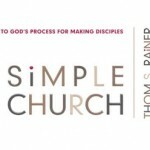 Simple Church : Returning to God’s Process for Making Disciples. Nashville, Tenn.: Broadman Press, 2006.